Recently I made a short trip to Lebanon, despite a lot of “But is it safe?” from everyone I mentioned it to. 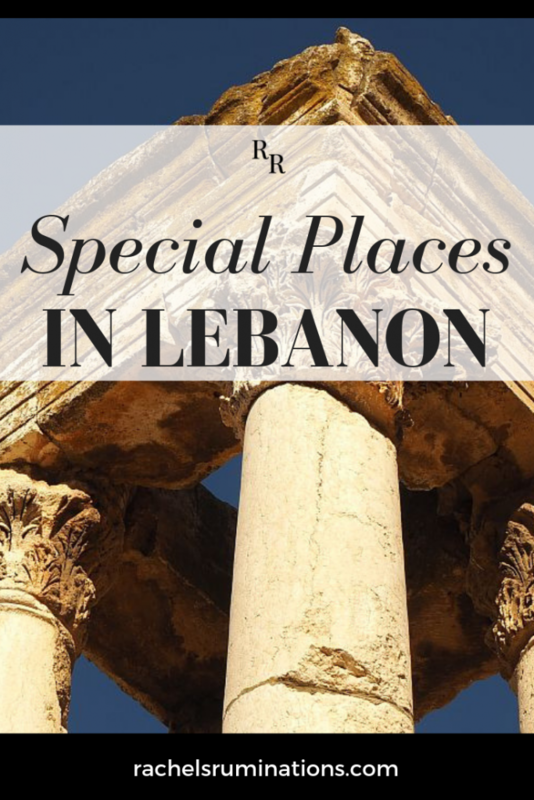 I’ll write about the travel warnings at the end of this article, but first I want to report on all the special places in Lebanon that I saw in the two free days I had. I already wrote a separate article on the outstanding Baalbek ruins, but here I’ll describe the rest. And another disclosure: I paid full price for both of the tours described below, so this is NOT a sponsored post. As always, all opinions are my own. Corinthian columns at Anjar UNESCO site. If you read this website regularly, you’ll know that I love UNESCO sites. 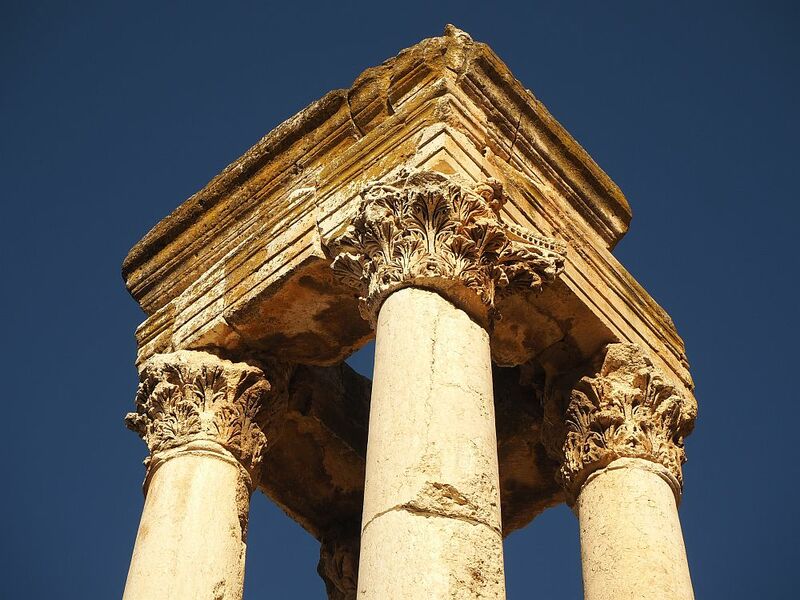 I chose this guided small-group tour because it included two UNESCO sites: Anjar ruins and Baalbek ruins. The third sight was a winery tour: less interesting to me, but I didn’t have much choice. As we drove from Beirut to our first stop, the Anjar ruins, our excellent tour guide, Natasha, gave us lots of information and background about Lebanon and its history. That was helpful because it has a lot of history: literally layers upon layers with civilization replacing civilization. The Canaanites, the Phoenicians, the Persians, Greeks, Romans, the Byzantine empire (Christian), the Ummayad empire (Muslim Arabs), the Crusaders (Christian again), the Mamluks (Muslim again), and the Ottomans (Muslims too) – I think I may have missed a few in the list. 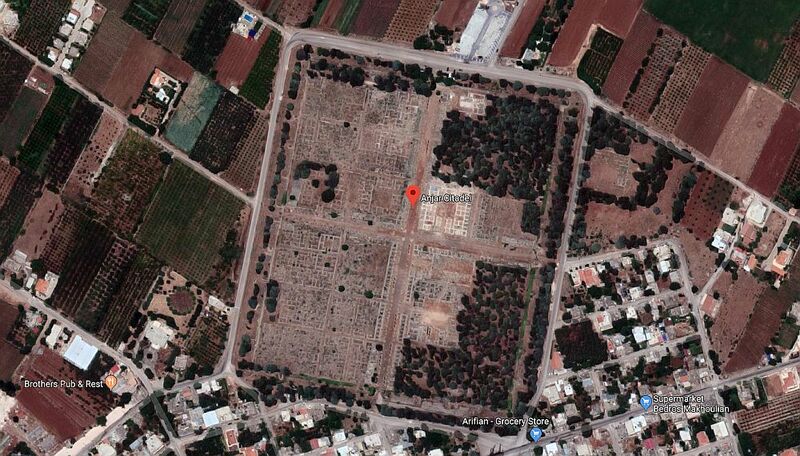 Natasha, who trained as an archeologist, pointed out something that had never occurred to me about archeological sites that are open to the public like Anjar. Archeologists have to make a choice when they research a site. Since they might discover remnants of many different civilizations, often layered on top of each other, they have to pick one to highlight and, as needed, to restore and stabilize. That can mean, though, that later layers added on top might have to be moved or even destroyed. 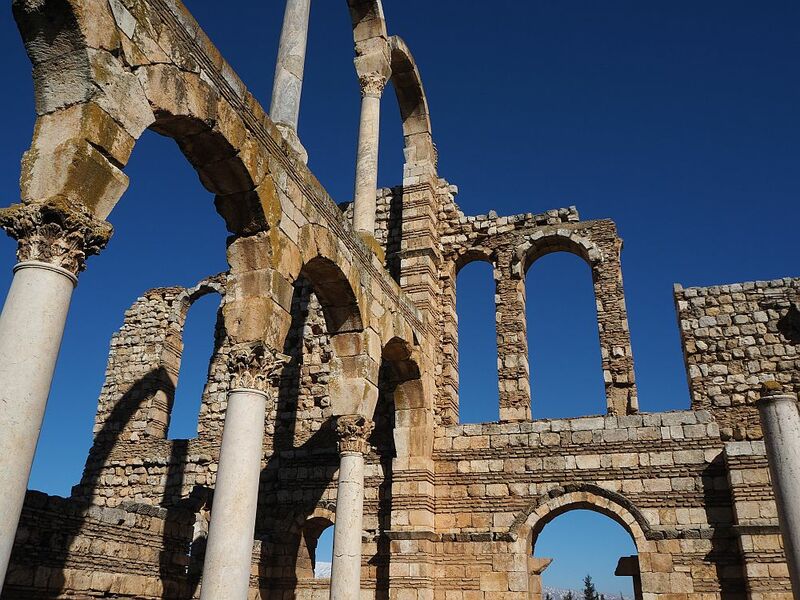 The Anjar ruins, then, have been preserved at the level of the Ummayad period, which lasted from about the 7th century until the First Crusade in the 11th century. At Anjar UNESCO site, the palace is partially reconstructed. Anjar was a palace-city, built in the 8th century and destroyed in battle in that same century. Located at a crossroads between the routes from Beirut to Damascus and Homs to Tiberiade, it is, according to UNESCO’s description, “a unique example of 8th century town planning.” A rectangular walled city, it had 40 towers, the thick, rounded bases of which are still visible on what remains of the walls today. The city had a palace for the Caliph and smaller palaces which served as harems, as well as baths and other buildings and facilities. Anjar’s city planning is clearly visible in this Google Maps satellite view. Natasha told us that after its destruction, Anjar served as a quarry of sorts for centuries: when builders needed stones, they took them from the site. Archeologists excavating the site later did the best they could with what was left. They focused on the original Ummayad town, reassembling walls in decorative rows of stone, typical for the period. Where they had enough pieces, they put arches and columns together. Natasha pointed out places where this wasn’t done correctly – columns that don’t match their bases – but the archeologists didn’t have much choice. In this view, you can see a rebuilt archway with mismatched columns, edging what was once a road through Anjar. Notice the rebuilt wall: the alternate rows of stones is apparently characteristic of the Ummayad style. In the distance is a set of four very tall Corinthian columns. Besides a few sets of columns and arches and a partial wall of a palace, most of the ruins are quite low. What’s interesting is primarily the layout, as the UNESCO description implies. Baalbek was the highlight of Lebanon, as far as I was concerned, out of both days of sightseeing. You can read why in my article here. I was glad that I saw Anjar before Baalbek because Anjar would have seemed a real letdown after seeing Baalbek. Thoroughly impressed by Baalbek, it was unlikely that anything else would make much of an impact that day, and Chateau Ksara Winery did not, though it was a pleasant enough visit. We started with a very quick tour of the winery, but its speed may have been because we arrived a bit later than planned. 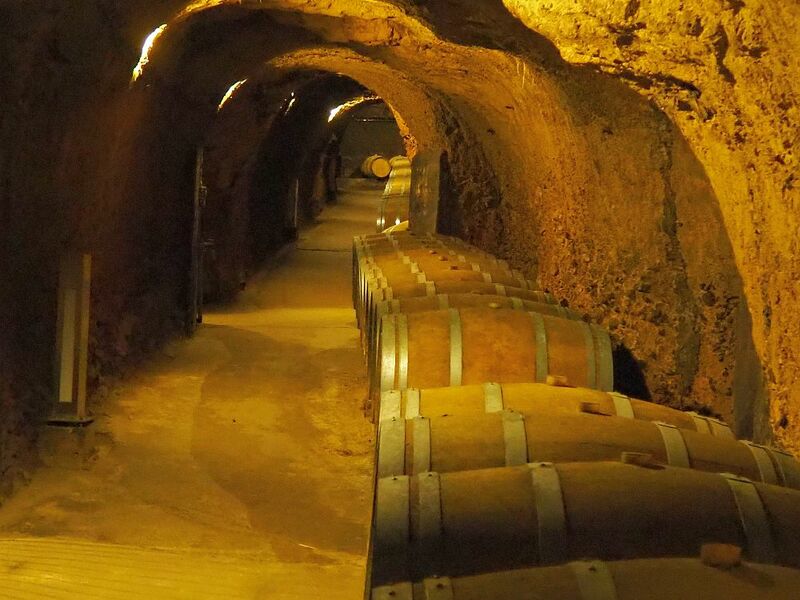 Ksara Winery is unique in that the wine is stored in large casks inside tunnels that probably date to Roman times. The winery’s tour guide told us the story of how they were found in 1898: a story involving a fox that stole an egg, and a monk who chased it. The winery was founded by Jesuit monks in 1857 and uses grapes grown in their vineyards in the Beq’aa valley nearby. 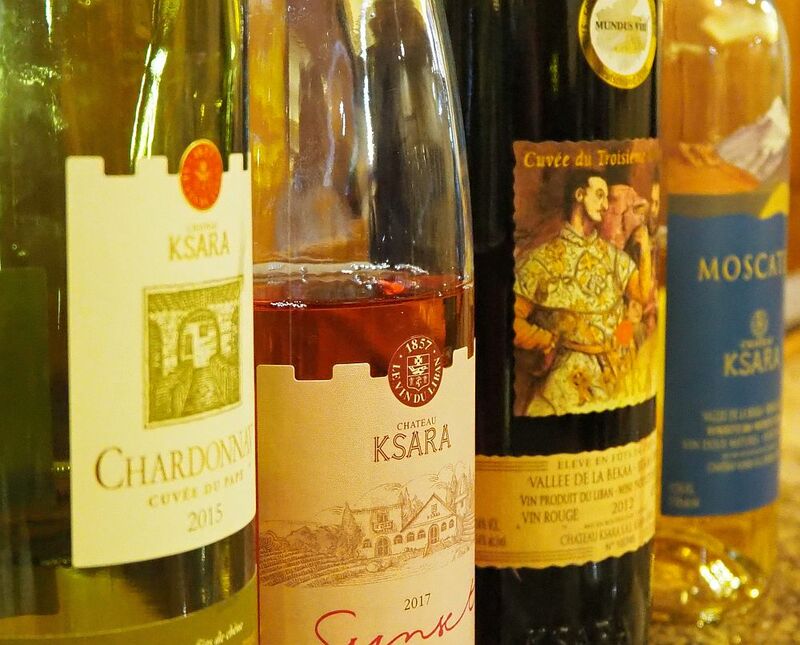 After the tour, we tasted some wines: a rose, a white, a red and a sweet white dessert wine. I’m no wine connoisseur, but they tasted good to me, particularly the rose. Perhaps just in contrast to our professional guide, Natasha, I wasn’t particularly impressed with the tour of Ksara or the wine-tasting: both seemed rushed, and the guides recited their spiels rather mechanically. On the other hand, if you’re wine connoisseur, you’d probably love it. 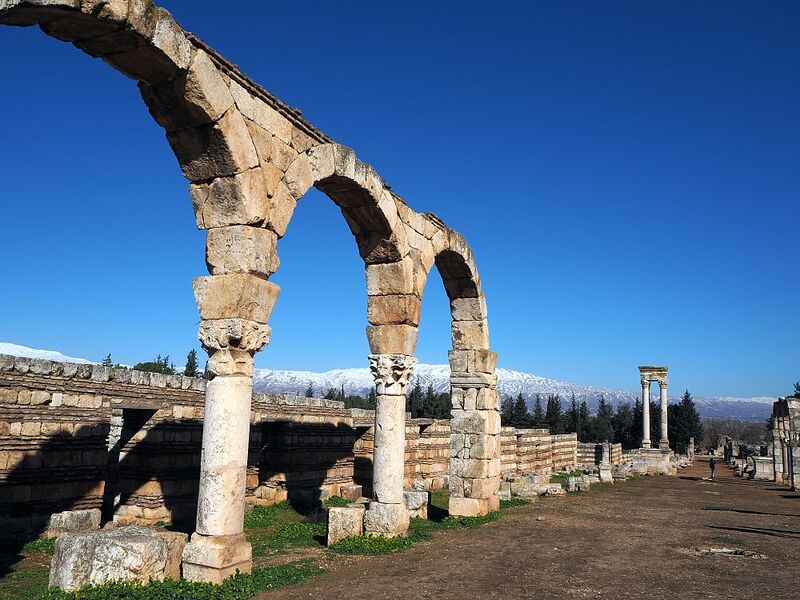 You can book this trip to Anjar, Baalbek and Ksara from Lebanon here. It starts at $95 for the day and includes hotel pick-up and drop-off, a big lunch and all admissions. On my second free day, I took another tour with the same company, Nakhal. What I really wanted to do was go to a UNESCO site called Ouadi Qadisha and the Forest of the Cedars of God. This is a valley dotted with ancient monasteries and what remains of the cedars of Lebanon of Biblical fame. 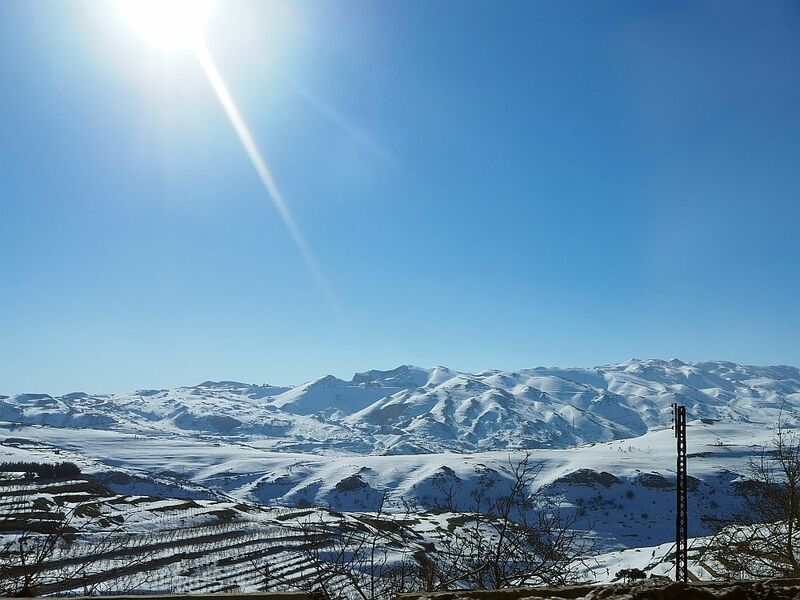 However, the tour company told me they couldn’t be sure we could even get there because of the snow in the Anti-Lebanon Mountains. The roads wouldn’t be clear. Did you know there is snow in the Middle East? I didn’t. On our way to Baalbek, though, on the first tour, I saw what they were talking about. Apparently Lebanon has six ski resorts. I took this photo through a window of the mini-van on our way to Baalbek. Anyway, since I couldn’t go to Ouadi Qadisha, I chose a different full-day tour, solely because it included another UNESCO site: Byblos. Our first stop, though, was Jeita Grotto. Actually two grottos are open to the public: naturally-occurring limestone caves that are dramatic and otherworldly. Unfortunately, the management is very strict about their policy of not allowing photography, requiring visitors to lock their cameras and phones into lockers at the entrance. 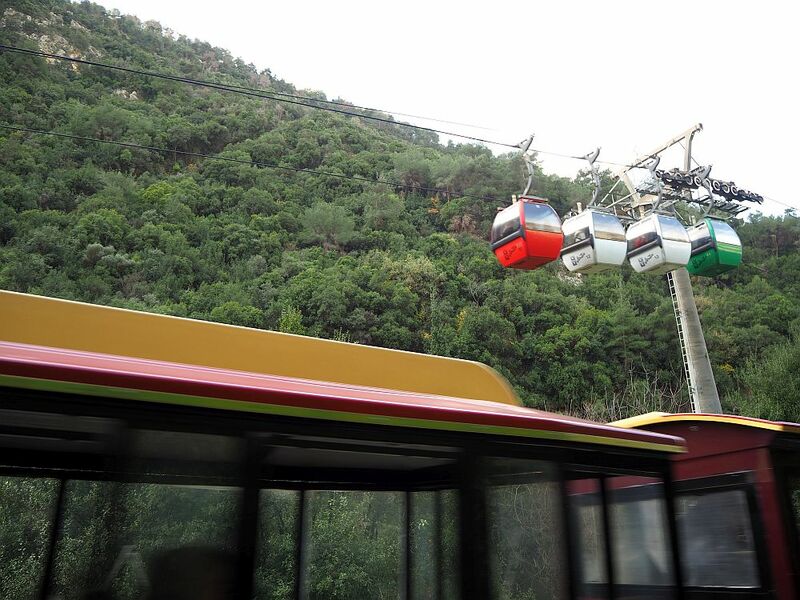 To get to the grottos we took a cable car “ropeway” the short distance up the hill. The cave we entered first, the upper grotto, is a geologist’s dream. We walked 700 or so meters into the cave and back again, admiring the complicated formations of stalactites and stalagmites, dramatically lit. The walkway has a railing and is neatly paved, and includes stairways here and there. Apparently the cave’s actual length is over two kilometers. Next, we were offered a “train” to go to the lower grotto: one of those tourist trains on tires, pulled by a motor vehicle decorated to look like a train engine. We chose to walk down the hill instead. It wasn’t far or steep or difficult. The lower grotto, we had been warned, might be closed; the water had been too high for more than a month. Luckily, it was open for the first time the day we visited. The “train” passed as I took a photo of the ropeway. We locked our cameras again and, upon entering, it became clear very quickly why high water might be a problem. Tourists see the grotto via electric boats. The problem is that, once we boarded a boat, entering the main expanse of the grotto involved riding under a natural archway in the rock. We all had to bend low in order not to bump our heads on the way through. If the water had been just a few centimeters higher, we wouldn’t have fit. Inside, other than the fact that we rode a quiet boat on deep green water, the cave looked much like the upper grotto: plenty of stalagmites and stalactites to admire. The indirect lighting lent an otherworldly atmosphere as it shone on the water. Our next stop was Our Lady of Lebanon in Harissa, north of Beirut. 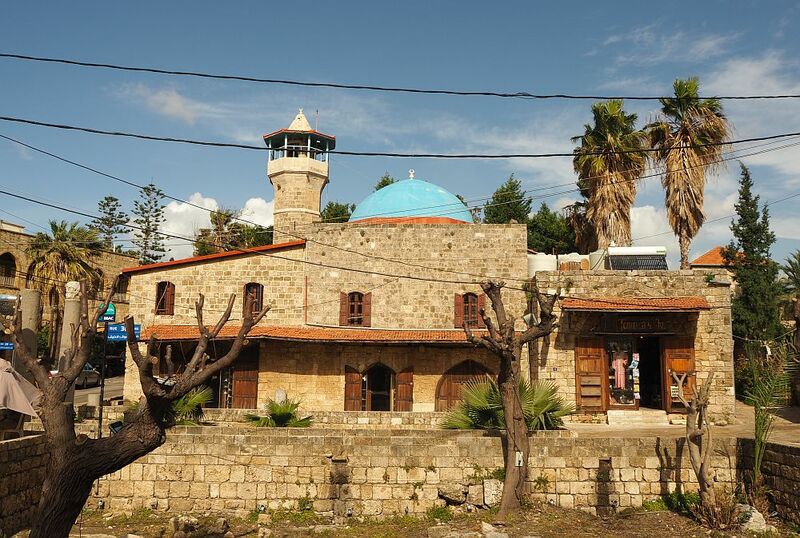 A massive shrine dedicated to the Virgin Mary, it’s an important pilgrimage site for Lebanese Christians. 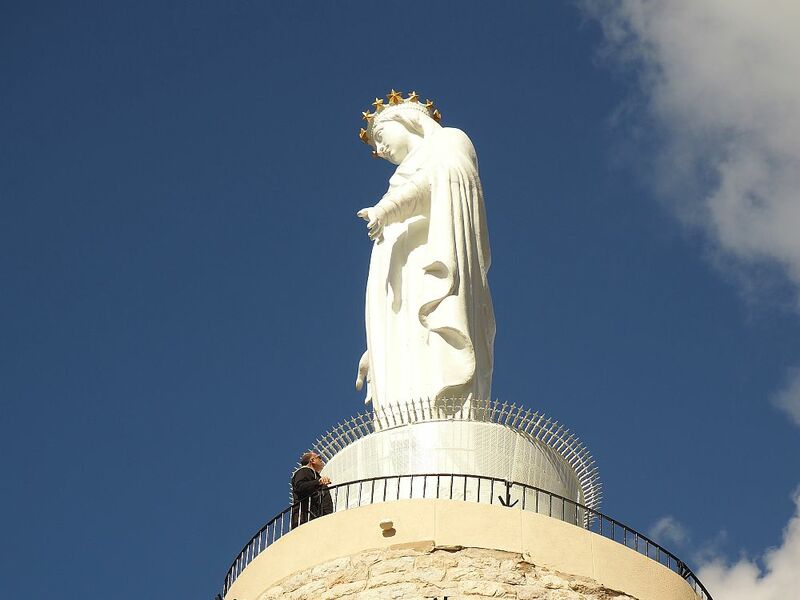 The statue of Mary on top of the shrine is 8½ meters tall, and it stands on a pedestal of 20 meters, all of which stands on a hill far above the city. The statue, made of bronze and painted white, dates to 1907. The Our Lady of Lebanon shrine. Notice the man just below it, just to give you a sense of the size. The point of this stop for our tour group was to see the view, which is, indeed, breathtaking. I climbed to the base of the statue and took photos, then took more photos from the overlook below the statue. While we had arrived by mini-van, we left via a gondola lift that brought us down to almost sea level. The views on the way were spectacular too, but I was too busy being afraid to manage any good photos. 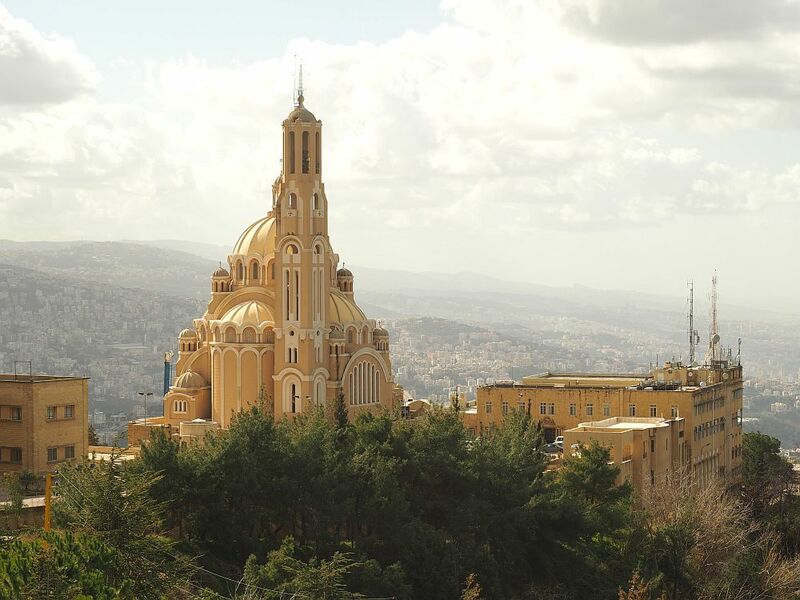 The Basilica of St. Paul, a Catholic church, tops a neighboring hill, and the city of Beirut covers the hills behind. I took this photo from the plaza at the base of the statue. After an excellent and very big lunch, our next stop after Our Lady of Lebanon was further north along the Lebanese coast: Byblos. Byblos was the only UNESCO site on the day’s itinerary. It is significant as the place where the Phoenician alphabet developed, and also as a place with evidence of thousands of years of habitation by a series of civilizations. This site goes back all the way to 8800 BCE in the early Neolithic period and grew in importance under the Egyptians and later the Phoenicians – and a whole list of other inhabitants over the centuries. I haven’t counted them all; if you’re curious, read the description on Wikipedia. There are several elements to the UNESCO site designation, but we only saw the “Intra-muros” part: the city enclosed and defined by medieval-era walls. First, though, we stopped at Byblos Harbour, a picturesque little fishing port that has been in use for literally thousands of years. On our visit it seemed a sleepy place, with the remains of a tower (I’m not sure of the period) guarding the entry to the port. The boats are a mix of fishing vessels and sightseeing boats. 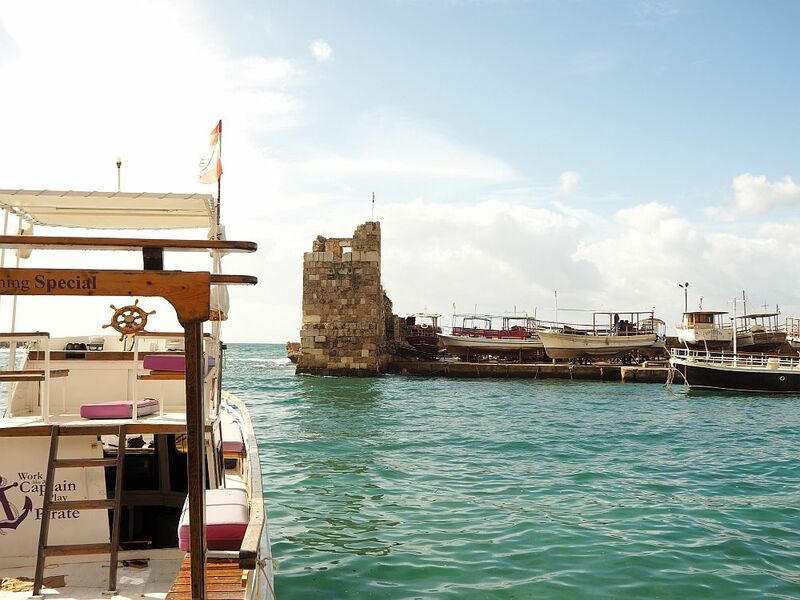 A partial view of the little Byblos harbour, with an ancient tower guarding the entrance. A moored tourist boat in the foreground. 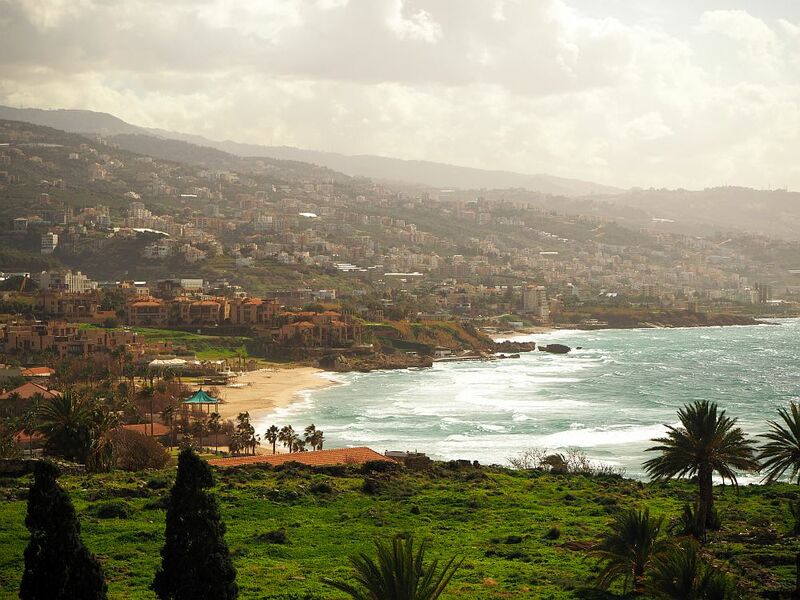 The main Byblos UNESCO site is very close by, set on a scenic spot overlooking the sea. Right outside its entrance is the pretty little 17th-century Sultan Abdul Majid Mosque. 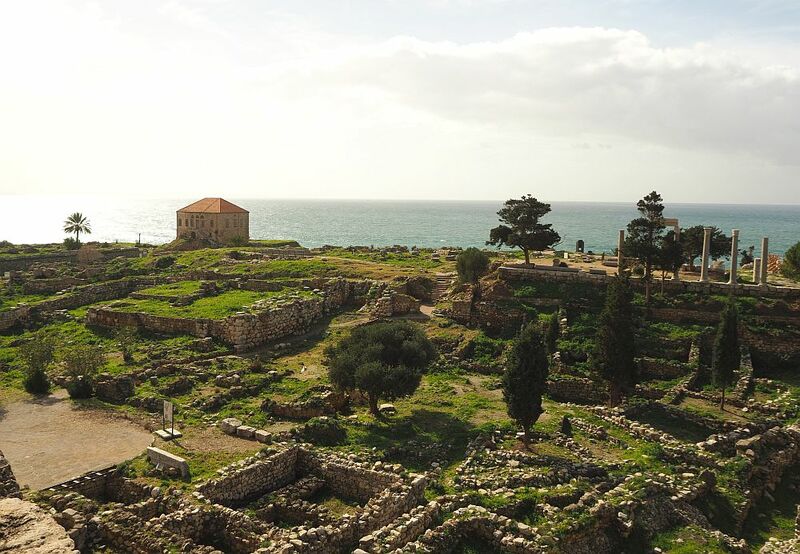 Because so many different civilizations succeeded each other one after another, the ruins at Byblos are a bit jumbled. The most prominent building is actually quite “recent”: the Crusader-era Byblos Castle. 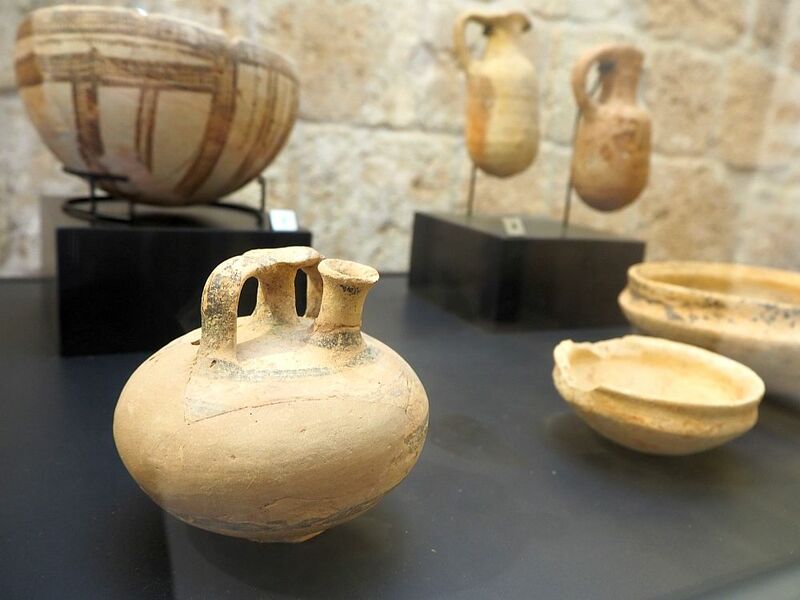 The castle houses a museum these days, explaining Byblos’s complicated history and displaying various excavated artifacts. Unfortunately the best artifacts have been moved to the National Museum of Beirut. Artifacts from the Bronze Age (3000-1200 BCE) at Byblos: these items show that Byblos traded with Egypt. The jar in front is from Mycenae. 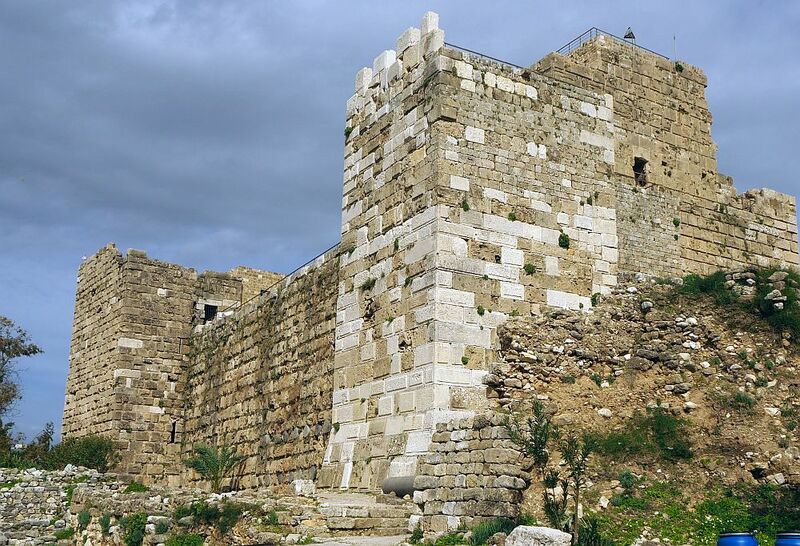 Byblos Castle is a great spot from which to see the extent of the whole UNESCO site. From its roof, you can spot a small Roman theater, lots of Phoenician foundations, the “temple of the obelisks,” some sarcophagi, a piece of a Roman road, and a variety of other bits and pieces. I was glad we had a guide with us to tell us what everything was. I would have liked a bit more time to walk to the far end of the ruins. A very partial view of the Byblos archeological site. In the foreground, ruins of buildings; I think they’re Phoenician. You can see some Roman columns in the background. We did have a short time to take a quick look at the medieval town, which is still surrounded by its Crusader-era walls. Another visitor and I headed to a building we had spotted from the castle: a lovely medieval-era church which, fortunately, was open. St. John the Baptist church dates to the 12th century. 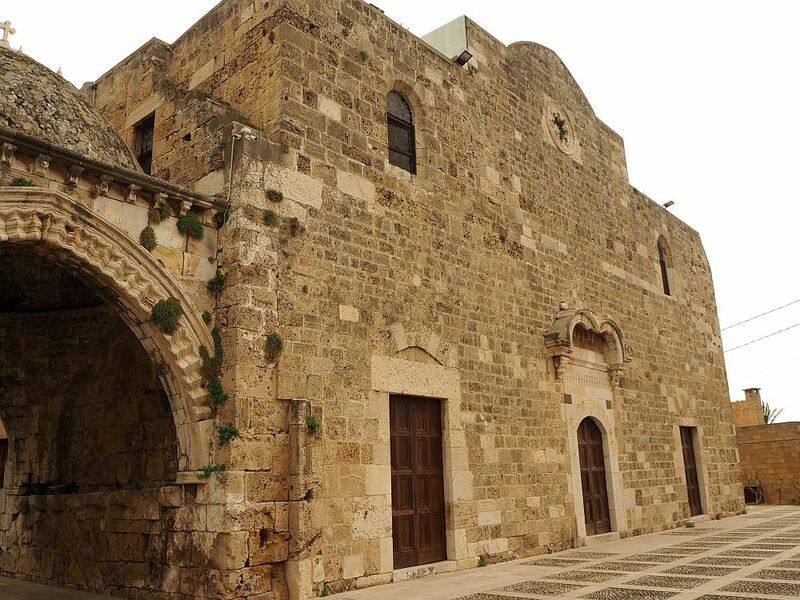 The 12th century Church of St. John in Byblos. The shopping streets we passed through, shaded by trees and vines, looked very pleasant for a bit of souvenir shopping and I assume would be busier on weekends and summer evenings. We came across, on a side street, a set of what looked like very old mosaics, outside and exposed to sun and rain. I suppose if you have so many antiquities all over the place, you can just ignore ones that aren’t particularly spectacular. 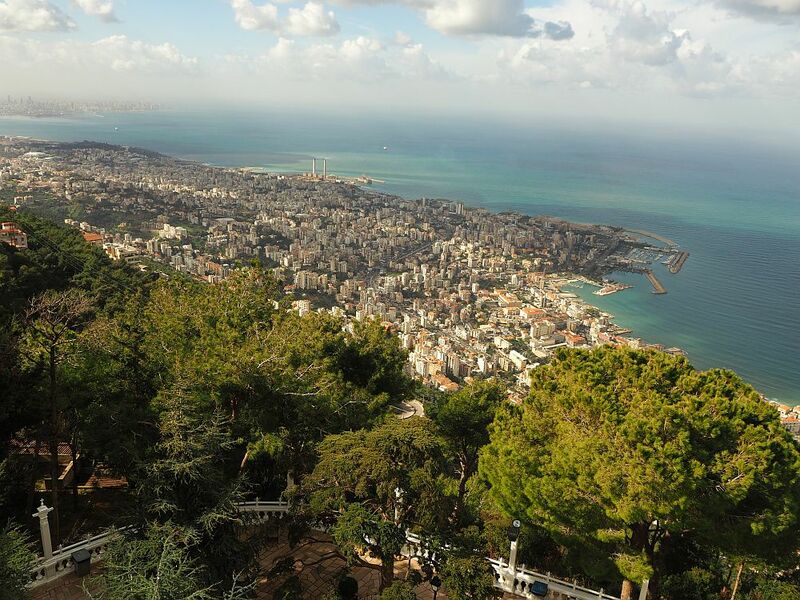 To book this tour of Jeita Grotto, Harissa and Byblos, click here. It includes hotel pick-up and drop-off, admission fees and a big Lebanese lunch.The same company also offers a shorter tour of just Jeita Grotto and Byblos. This one includes the pick-ups, drop-offs and admission fees, but no lunch. Is it safe to travel in Lebanon? As promised, I’d like to address the question I kept hearing: “Lebanon? Is it safe?” I ignored this until my travel insurance provider sent me its travel advisory about Lebanon. In my travels, I’ve learned to take travel advisories with a grain of salt. Sometimes they exaggerate, or they tar an entire country with the same brush. Violence happens, and people cancel trips. I generally don’t. This one, though, worried me. A view down the shoreline as seen from Byblos Castle. I had already agreed to the workshop in Beirut, so the decision I had to make concerned sightseeing: how much should I plan and where would it be safe? Consulting a map, I realized that the thing I most wanted to see, the Baalbek UNESCO site, is in the Beq’aa Valley and within 10 kilometers of the Syrian border. Should I forget sightseeing outside of Beirut and just explore the city? Instead of just trusting this advisory, I decided to ask a local: the workshop’s organizer. She insisted it was safe to go to Baalbek. The travel advisory still nagged at the back of my mind, though, which was why I decided to sign up for a group tour instead of renting a car to go there on my own. After all, a tour company wouldn’t put tourists at risk, right? It would mean the end of their livelihood. Group tours are not my favorite. Having to go at someone else’s pace annoys me and sometimes so do the other tourists. But I was lucky with both tours I took: the pace was mostly about right, and my fellow tourists were pleasant. The tour guide for both days was excellent, the minivan was comfortable enough, and the lunches on both days were delicious. I can’t guarantee you’ll be perfectly safe, of course. No one can. We passed lots of refugee camps on the first day’s tour through the Beq’aa Valley – white tents in neat lines along the edges of fields, where presumably the militants the travel advisory mentions are hiding. Nevertheless, I didn’t feel that I was in any danger on any of our stops. This is a country that very much wants tourists to return, so it’s in their best interest to keep us safe. Taken from a moving mini-van, this photo shows the sorts of Syrian refugee camps we passed all along the way toward Baalbek in the Beq’aa valley. Our tour guide explained that the local municipalities arranged, with the landowners’ permission, for the refugees to be allowed to live in tents on strips of land along the edges of fields. Lebanon has taken in a million refugees. I’m glad I didn’t let the warnings stop me. Baalbek in particular was truly special and I’m so glad I got to see it. 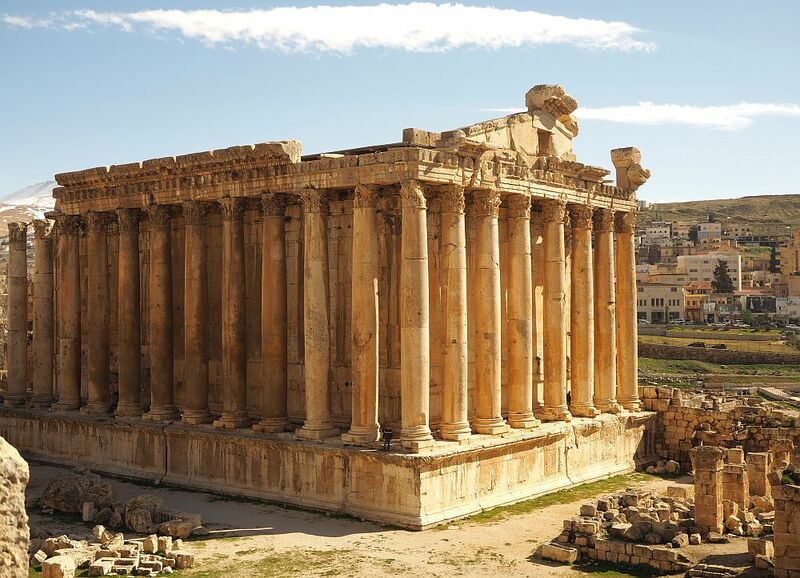 If you’re looking for recommendations of what to see and do, Baalbek is far and away the top of the list. If you want to take your time, you’ll probably need to hire a private tour or, to save money, sign up for a group tour, as I did. This link shows a wide variety of private and group tours, mostly leaving from Beirut. I’d appreciate it if you would share this article far and wide. The images below are formatted for pinterest. 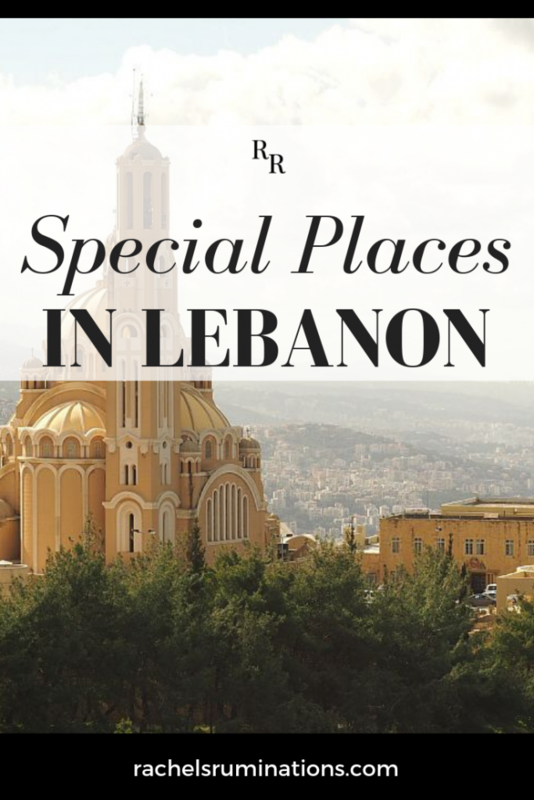 Lebanon is still one of my favorite destinations and I enjoyed reading about your experiences. Definitely need to get back there again soon.